I am far from a domestic diva. I don’t necessarily burn everything I cook. I’m not a total disaster in the kitchen really. I can read a recipe and follow directions. I know how to use Pinterest. I actually use that to find different recipes if they look pretty easy and is not one which requires five different appliances. Forget the crafty part of Pinterest… I like to browse but let’s be real; I can’t even color in the lines with my toddler so there is no way I am going to make a pretty craft or a DIY father’s day gift. Honestly, I would say I am not a creative wife or mother when it comes to “domestic” things and I am okay with that because I know there are other areas I do pretty well in. I am most definitely a “domestic diva” in training. I had the opportunity to try something new that is supposed to make cooking very simple and delicious. 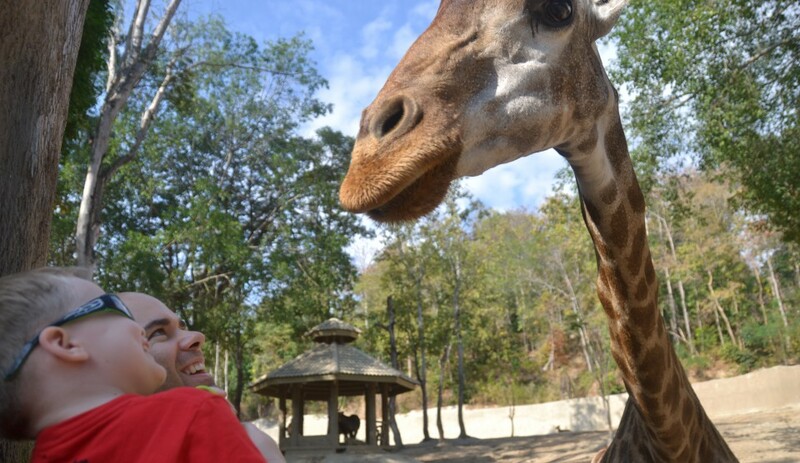 I am happy to share that information with you because it was probably the easiest dinner experience I have had besides picking up the phone to order pizza. Marion is a cook, author, television star, and food producer. Being half Thai and half Australian, she grew up with having a mom in the kitchen making delicious Thai and Asian dishes full of bold flavors, fragrant spices, and fresh ingredients. She loves Asian food and that love has translated into this Marion’s Kitchen food line. Marion’s Kitchen is extremely popular in Australia and due to business booming they are taking their products global and luckily for us they are landing on the shelves of major distributors in the United State. There are currently ten Asian and Indian inspired meal kits available, with dishes ranging from butter chicken to Thai massaman curry and pad Thai. All of the meal kits provide top quality all natural ingredients plus you add the fresh ingredients such as your meat and veggie of choice. Any “domestic diva” can make a restaurant quality meal for her family at home with ease. 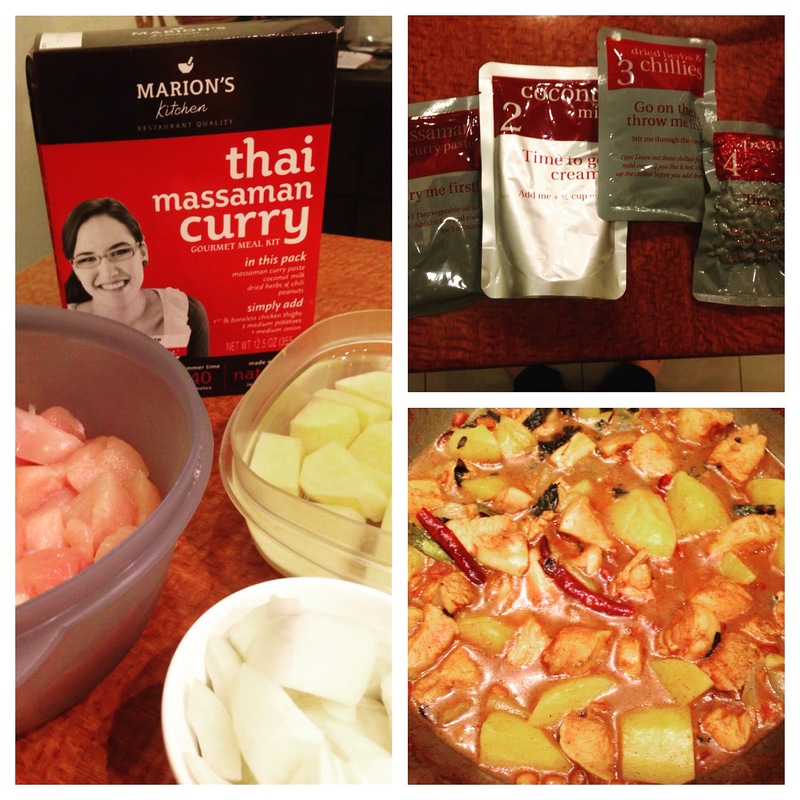 We tried Marion’s massaman curry, a dish we love in this house. I have been to the Thai cooking school to learn how to make this curry as well, which is a little more of an in depth process since they teach you how to make the curry paste, but even with taking a class when it comes game time to make it with the cooking school’s recipe I tend to get really nervous and feel as if I am out of my depth. I was thrilled to open this box to see there are packets with numbers on them for each step! Seriously?! Numbers!? I said to myself “Yes! This is going to be easy!” and it was. On the back of the box there are simple instructions telling you when to add which step and BAM 40 minutes later you have dinner ready. Inside the packets you will find your curry paste, which is the base for all curry dishes, coconut milk, air-dried herbs and whole spices such as the red Thai chilies, and in this recipe they had peanuts to add with your fresh ingredients. On the box, Marion has recommended the meat and veggies for you to use and how much you will need. Maybe you aren’t a huge fan of chicken but would rather have beef, no problem because on the back of the box there are several different options for you to try. I would also assume if you are vegetarian you could add whatever vegetables and tofu you desire. easy as 1. 2. 3. 4. This was a great meal option for my family. We enjoyed the dish and the authentic flavors and had enough for leftovers a few days later. I know once we move back to the US at the end of the year, we will greatly miss Thai food. I am so happy to know Marion’s Kitchen is an easy option to fill our bellies, especially when Thai restaurants back home are relatively expensive. Marion’s Kitchen meals is all over Australia but if you are living in the United States you can find this product in Target, Fresh Market, and Kroger just to name a few. If you want to see the list of other retailers carrying this product visit their website. I would also encourage you to download Marion’s Kitchen App for Android or for your Apple products. She has tons of free recipes available on there for you to try out. Check her out on Facebook, Twitter, Pinterest and Instagram. This entry was posted in Product Reviews and tagged cooking, domestic diva, fresh market, kroger, marion's kitchen, product review, target, Thai food. Bookmark the permalink.